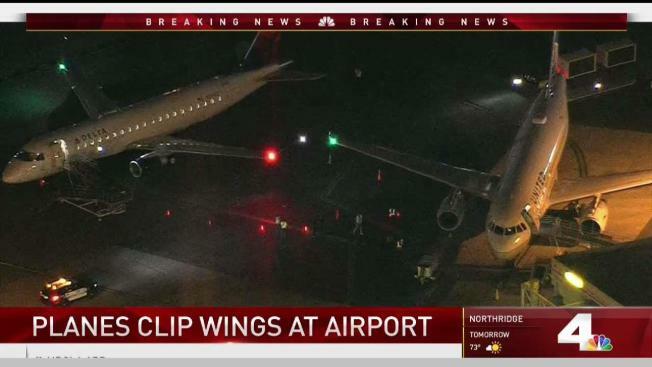 Two planes clipped wings at Hollywood Burbank Airport Tuesday night. Police reported no injuries, and both airlines involved confirmed that the contact did not have any result in any injuries. Gil Leyvas and Newschopper Bravo were over the scene. The damage to both planes was minimal. A statement from United Airlines stated that an "aircraft briefly came into contact with another aircraft that was taxiing at Burbank. There were no passengers on board the United aircraft and no reported injuries." SkyWest Airlines, which owned the other plane involved in the incident, also released a statement: "After a routine landing in Burbank, California, a wingtip of SkyWest flight 4673, operating as Delta Connection from Salt Lake City to Burbank made contact with another aircraft wingtip while taxiing to the gate. There were no injuries and all 42 passengers deplaned normally through the main cabin door." 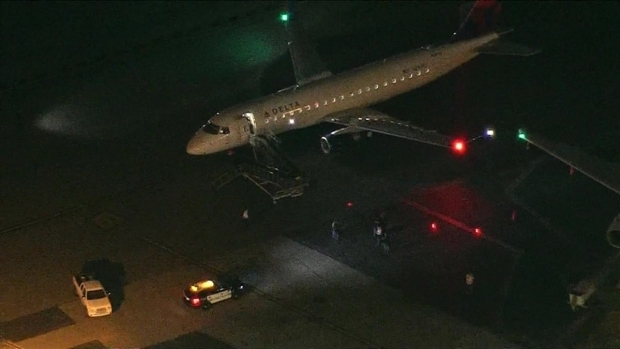 Two planes clipped wings at Hollywood Burbank Airport on Tuesday night. No one was injured. NBC Newschopper Bravo was overhead.